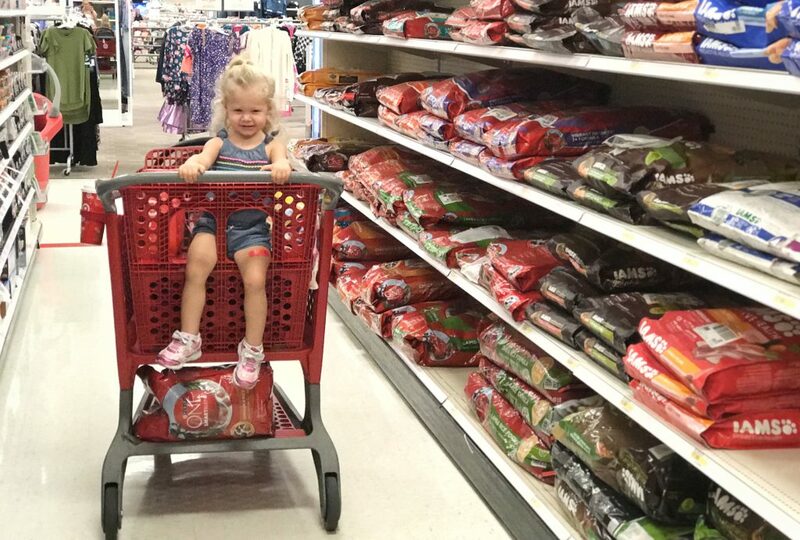 I’m so excited to partner with Purina® ONE® and Gerber® to share the details of this year’s Giggles and Wiggles Gerber Baby photo contest and a few of our favorite Purina and Gerber products available at Target. 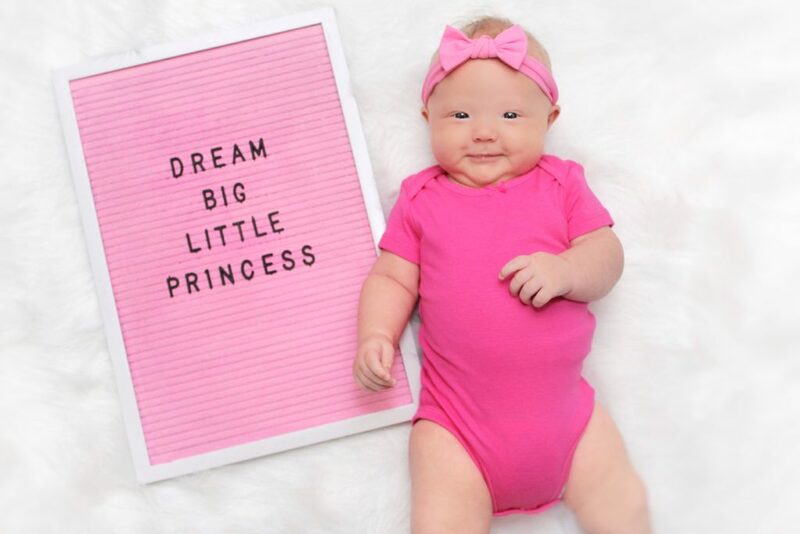 Because of my partnership with Gerber, my little one is ineligible to win the Gerber Photo Search or a weekly prize, but you may be eligible so make sure you submit a photo of your baby and/or pet! I don’t know about you, but shopping at Target is one of our favorite “adventures” and you can find us there at least twice a week. Where else can you eat popcorn and sip a Starbucks drink while perusing the latest fashion trends and also shop for groceries? Even my 2 year old squeals with delight when I tell her we’re going to Target, a girl after my own heart! 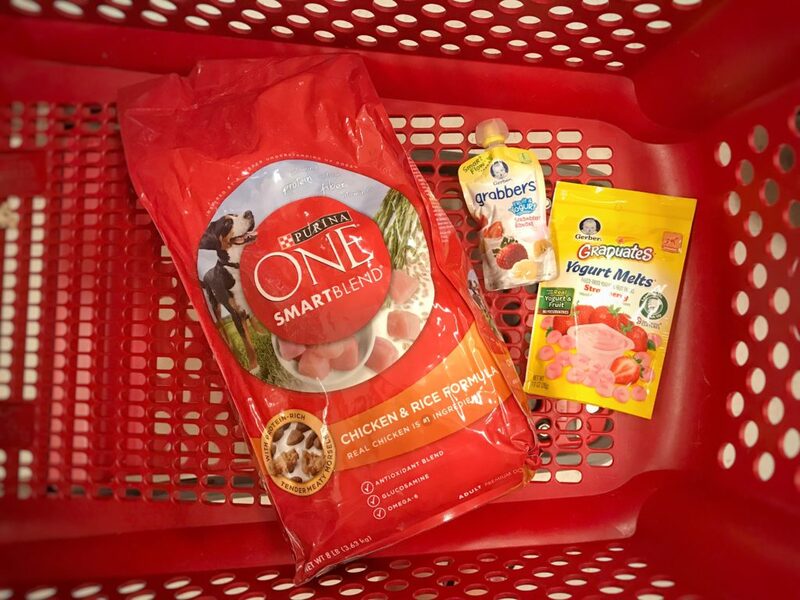 Our Target finds on our most recent trip included these delicious food items for both my daughter and my fur babies. 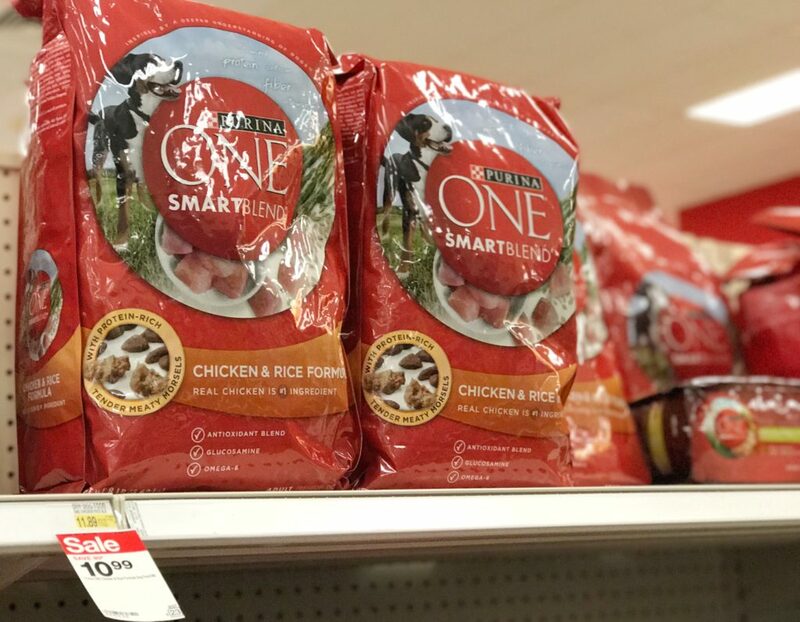 People often think Purina ONE is more expensive at Target, but it’s actually competitively priced. It was even on sale last week when we went shopping. 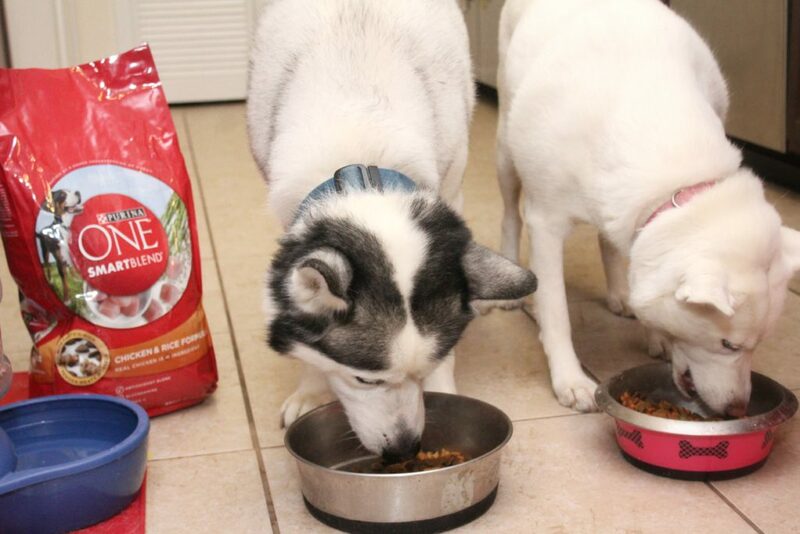 Purina ONE’s Smartblend of ingredients means complete and balanced nutrition that can support your dog’s well being at every life stage — and real meat is always the first ingredient. 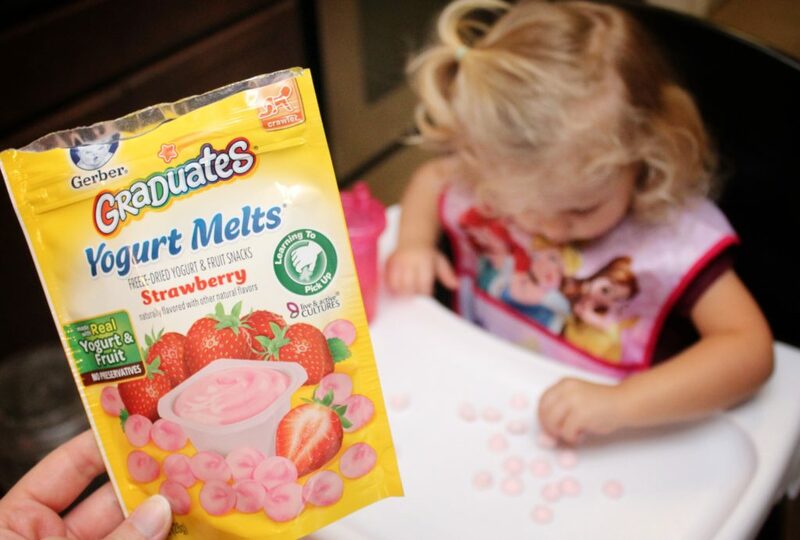 My toddler is a huge fan of Gerber snacks, especially these Strawberry Yogurt Melts. These tasty snacks are made with real yogurt and fruit. With live and active cultures and a good source of Vitamins A, C, and E, these snacks combine the delicious taste little ones love with the wholesome nutrition parents love. Each bite melts in your little one’s mouth and is easy to chew and swallow plus there’s no preservatives! 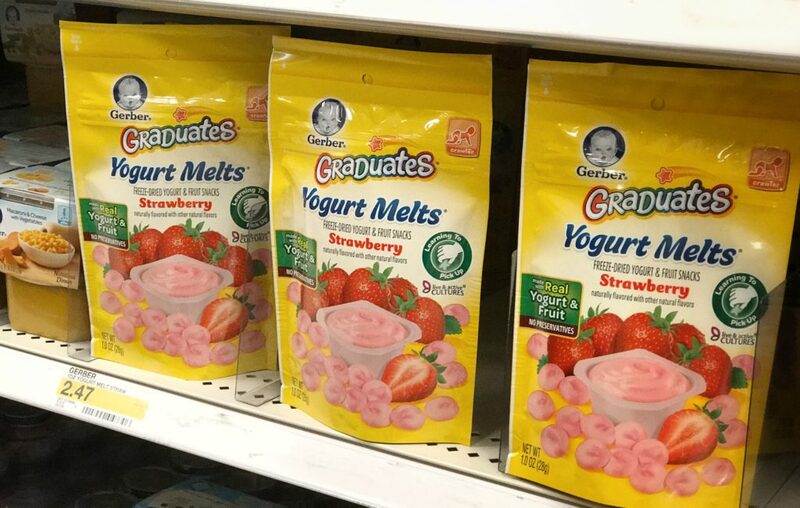 I also keep these Gerber Grabbers Fruit and Yogurt Strawberry Banana pouches handy that feature Gerber’s proprietary Smart Flow spout that helps control the amount of food that comes out — so there are more sips and less “oops.” Each pouch has one 1/4 cup toddler serving of fruit from 1/3 apple, 1 1/2 strawberries & 2 tsp banana and includes 2 1/2 Tbsp of yogurt. 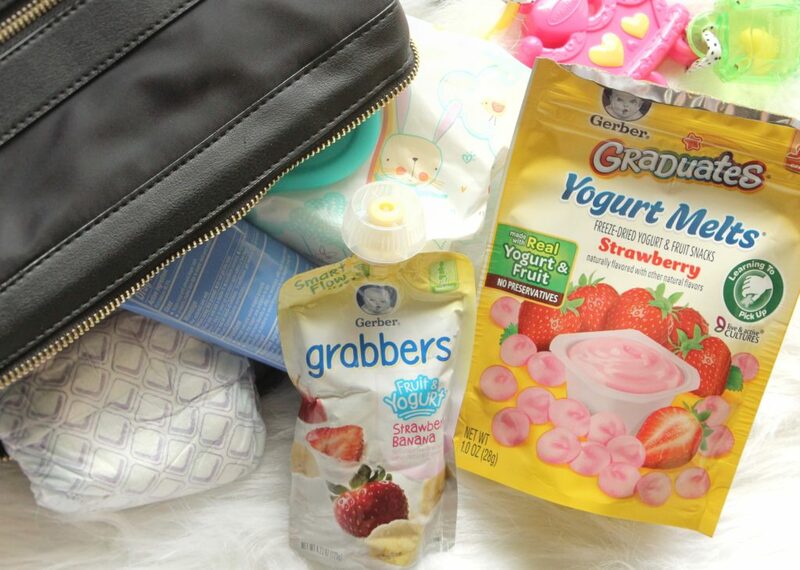 These are a diaper bag must have and come in handy when my daughter needs a snack on the go. Do you have a child 48 months or younger? Are they super cute and photogenic? You should enter the Purina/Gerber National Baby Search! This year there are TWO great contests to enter which means more chances to win! Be sure to refer to the official rules for full information on both contests. Every parent thinks their baby is the next “Gerber baby” and every year Gerber parents anxiously await the announcement of the next Baby Search. You can enter the 8th annual photo contest by posting a photo of your child (48 months or younger) on Instagram (must be a public account) and using the hashtag #GerberPhotoSearch2017. You can enter up to 10 times! One Grand Prize winner will receive $50,000 (can be used for child’s education) plus the title of 2018 Gerber baby. The photo search begins on 9/13/17 and ends 10/27/17. Here’s a sample photo below for the Gerber Photo Search contest. Additionally, there will be six (6) weekly winners, as chosen by judges, for Giggles and Wiggles Photo Search. Each weekly winner will receive a $500 prize pack, 1 year supply of Gerber baby food (valued at $600) and a 1 year supply of pet food (valued at $540). A qualifying entry for the Giggles and Wiggles Photo Search would be a photo of BOTH pet and baby. These entries should use both #GerberPhotoSearch2017, and #GerberGigglesandWiggles on a public Instagram post to be eligible to win. Here’s a sample below of a picture for the Giggles and Wiggles photo contest. Please refer to the Official Rules for additional information. NO PURCHASE NECESSARY. Legal residents of the 50 United States (D.C.) and Puerto Rico, who are 18 years of age or older, have a valid Instagram account and/or email address, and are parents of a child 48 months of age or younger and meet certain background check requirements. Enter search by: 11:59:59 pm ET on 10/27/17. For Official Rules, including eligibility and entry requirements, judging criteria and prize descriptions, visit www.Gerber.com/photosearch2017/rules Void where prohibited. The bond between a child and family pet is certainly a special one! 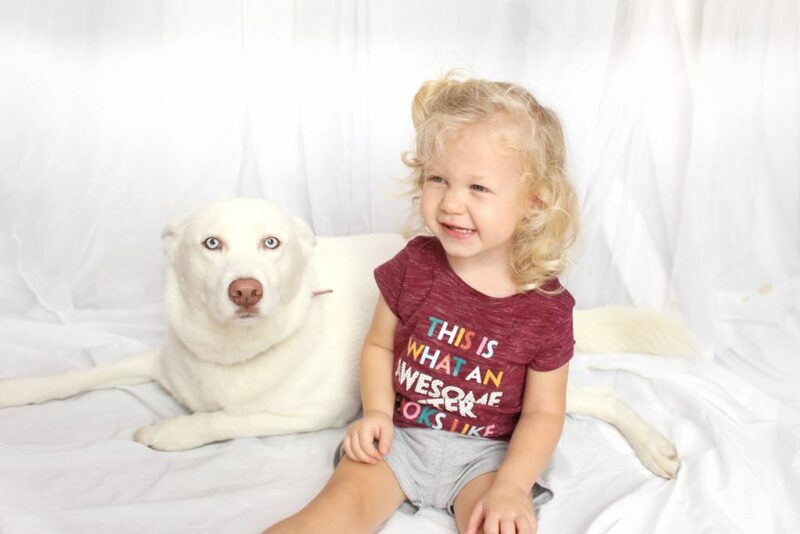 My two year old is best friends with our two huskies and plays with them daily. I love watching her interact with them, petting their heads and saying “good boy” in her adorable toddler voice. But just like anything else, bringing home a new baby to dogs can be quite the adjustment. When we brought home our first daughter, we researched several articles on how to help the dogs adjust. Here’s a few things we did that were successful! When bringing the dogs back home and introducing them to the baby for the first time, they were very curious and spent several minutes smelling the baby. It was great to have extra hands ready to help ensure baby’s safety. We just recently brought home our second baby and the dogs adjusted much faster and easier this time around. I remember them being more curious with our first daughter than with the second. I am so glad my daughters will grow up with their furry companions. There’s something so special and unique about the bond a child shares with their pet. 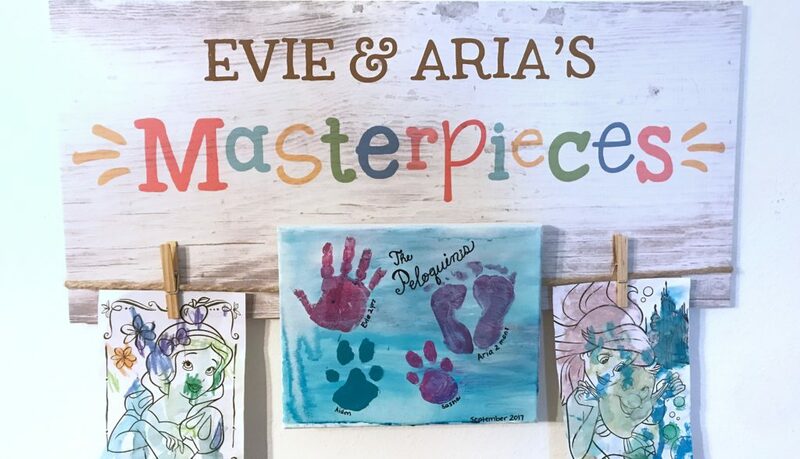 To capture their sweet innocence, and as a reminder of their special bond, we made this adorable paw/handprint canvas. Using washable, non toxic paint, in your color of choice, carefully paint onto the paw/hand. 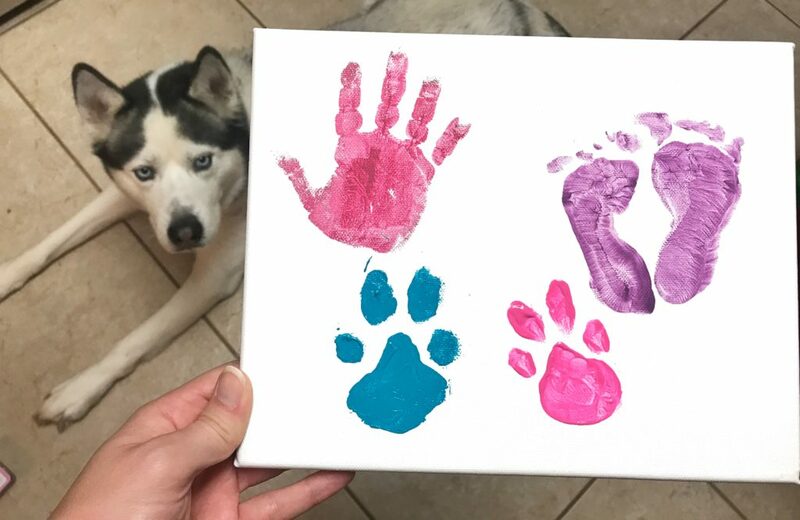 Stamp the paw/handprint on a canvas, I recommend an 8×10″ canvas. Use a wet washcloth or diaper wipe to clean up paint quickly. Using a black permanent marker, write in each pet/child’s name by their mark and add the date. I also added “The Peloquin’s” to ours. Optional: My daughter loves to paint so we painted with watercolor over the canvas as a fun project to do together.